SBI received a USDA Natural Resources Conservation Service Conservation Innovation Grant in late 2012 to produce biochar using an Adam-Retort manufactured and licensed by New England Biochar, led by the Sonoma Ecology Center. Biochar was produced from local “waste” biomass was distributed to three local farms for field trials on three varying soil types: Swallow Valley Farm near Bodega, Green String Farm in Petaluma, and Oak Hill Farm in the Sonoma Valley. Matching funds were provided by the Sonoma County Water Agency and in-kind contributions were provided by each of the farms and partners including: Gold Ridge Resource Conservation District, North Coast Resource Conservation & Development Council, and Sonoma Ecology Center. Sonoma Ecology Center was established in 1990 with a mission to work with our community to enhance and sustain ecological health in Sonoma Valley through community-supported research, restoration and education. Sonoma Ecology Center’s programs and initiatives increase appreciation and stewardship of our natural heritage and create measurable benefits in the areas of water, resources, biodiversity, energy and land use. Information about Sonoma Ecology Center can be found on our website. Sonoma Ecology Center has begun work on a collaborative project funded by a USDA Natural Resources Conservation Service (NRCS) Conservation Innovation Grant with support from the Sonoma County Water Agency (SCWA). 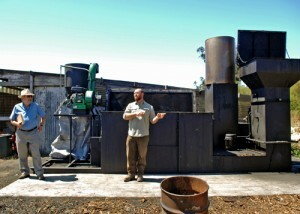 The Sonoma County Biochar Project features production of biochar from local wood wastes, field testing of its use and effectiveness at three local farms, and demonstration of renewable energy capture and use. Gold Ridge Resource Conservation District (GRRCD) and North Coast Resource Conservation & Development Council (NCRC&DC) are project partners. Biochar is a specialized form of charcoal made at relatively high temperatures in the absence of oxygen (in a process termed “pyrolysis”). Combined with compost or similar innoculant, it has been demonstrated to improve soil health, retain soil moisture, increase crop yields, and sequester carbon. To produce biochar, SEC will install an “Adam Retort” unit at Swallow Valley Farm near Valley Ford in west county. This steel unit can make about 500 pounds of biochar per day from locally available waste wood, diverted from land disposal or burning. The SEC team tested this biochar’s impact in controlled experiments at Oak Hill Farm (near Sonoma), Green String Farm (near Petaluma), and onsite at Swallow Valley Farm. For further information about the Sonoma County Biochar Project, contact Dr. David Morell, Project Manager, at (707) 996-0712 ext. 108 or davidm@sonomaecologycenter.org. For more information about biochar in Sonoma County, visit Sonoma Ecology Center’s partner and sponsored organization, Sonoma Biochar Initiative.